Luxury cigarette maker Nat Sherman may have set up shop in North Carolina, but the first new launch from its state-of-the-art factory is all New York - and it�s ready to take on the country. When luxury cigarette manufacturer Nat Sherman, Inc. considered moving its manufacturing facilities out of New York City in recent years, leaving behind its quirky, upper-floor facility on Manhattan�s West Side, the debate was an emotional one. But in keeping with the Sherman family�s passion for the tobacco industry, what was initially an overdue need for a more efficient facility became a striking opportunity to raise the stakes, and the latest in a series of commitments to the tobacco industry. The result was a brand new, sprawling 40,000 square-foot building on a 7 1/2-acre campus in North Carolina, located between Greensboro and Winston-Salem, that opened last summer. The facility is not an inexpensive tin building typical among the blossoming field of cut-rate, renegade cigarette makers, notes Joel, but rather a substantial brick-and-mortar investment in the company�s future, and a statement of the industry�s staying power in embattled times. The facility was designed with plenty of room for future expansion. �We love our industry, and we�re committed to it,� says Joel, adding, �We have put our money where our mouth is.� In spite of high taxation and a relentless legislative onslaught, the company elected to pull out all the stops in building the new factory. The investment is reminiscent of the company�s commitment cigar retailing over a decade ago, when it opened a richly appointed, high-end tobacco shop on Manhattan�s Fifth Avenue in 1989, a time when cigar sales were still shrinking. �We believed it was going to come back, and subsequently it did,� says Joel. What is New York Cut? 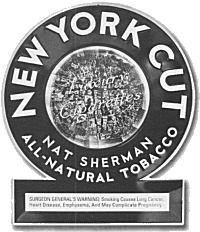 There is more than a little irony that the first brand launched from the company�s new factory draws so vividly on the firm�s New York roots, particularly given the intense anti-tobacco climate in the very same city that contributes so much to Nat Sherman�s persona. �We are the quintessential New York company,� notes Joel, whose father Nat started the business in 1938. But while production no longer takes place in New York, the family-owned company�s retail headquarters there remains a coveted destination among smoking connoisseurs, and the city is a central theme in much of the company�s promotional efforts. So, tapping the company�s home town for imagery and inspiration was a logical decision for a new national brand aimed at a wider audience. The concept for New York Cut initially grew from a study to update several existing brands, but eventually evolved into an effort to create a new stand-alone brand, one that could address several limitations identified among the company�s existing brand portfolio. In January, Nat Sherman flew its entire national sales staff to the new Greensboro, North Carolina factory to debut the launch of New York Cut. To fully appreciate the manufacturing process and see first-hand many of the new high-tech features of the facility, the Shermans also put them to work, trying their hand at numerous stages of the production line. New York Cut is a departure for Nat Sherman in a number of ways, made possible from a production standpoint by the new state-of-the-art manufacturing facility, but also designed to reach a market that the company�s traditional super luxury brands don�t or can�t, both through existing retail channels as well as new ones. First of all, New York Cut is an 85mm luxury cigarette line that not only maintains the company�s tradition of utilizing only natural tobacco, but is blended to appeal to smokers who might find the company�s traditional cigarette lines a bit too full-flavored. Like all Nat Sherman cigarettes, the tobacco is not flavored in any way. The physical cut of the tobacco is also unique to the line, an older-style rarely seen today. �It�s a broader cut leaf,� says Joel; �Not as narrow as shag. You take bigger slices out of the tobacco. It�s harder to run, but it produces a more even blend and a nicer, richer flavor of smoke.� It was more common to see this kind of cut when machines ran slower and people did a lot of hand blending, he notes. Packaging is another major departure. New York Cut is the company�s first product made available in the industry-standard hinge lid pack (HPL) format. The flip-top box gives the company a means of increasing distribution and extending the Nat Sherman brand to retail venues unable or reluctant to carry the distinctive shoulder boxes that are prevalent across all of the company�s existing lines. �That limits us from getting some of the distribution that we could get, where retailers can�t necessarily give us a Nat Sherman display, but would like to put us with the rest of their cigarettes - if we could fit.� Since all cigarette packing was completed by hand in the cramped Manhattan factory, larger volume runs of HPL packs were an impractical impossibility. �It had become inefficient to manufacture in Manhattan,� says Joel. �We were on the top floors of a block long building overlooking the Hudson River. Because of the space constraints we had to feed our manufacturing from a warehouse off-site, in Palisades Park, New Jersey. It wasn�t working out.� Now, the company has an ample amount of on-site storage space. �We think we can better serve our customer now,� says Joel. 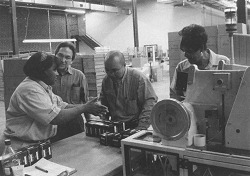 The ability to increase distribution was one goal; developing a lighter blend and a more affordable price were two others. New York Cut answers all three. Nat Sherman created some unusual point-of-sale materials designed to find a natural place in retail outlets, including tin signs (left), shelf talkers, leave-behind informational booklets, and a countertop display. Pricing for New York Cut squarely positions the new line in an emerging segment that falls somewhere between super-luxury brands - such as Nat Sherman�s existing lines - and full-priced premium cigarettes such as Marlboro. The brand is positioned as an �affordable luxury,� and to entice trial, pricing will be reduced initially, but will still fall within its target positioning. While the flip-top format may be more familiar to average smokers, the graphics are stand-out, tapping the spirit of Nat Sherman�s luxury image and its penchant for 1930s and 1940s style, but with a trendier feeling. Three versions are offered in distinctly individual packaging: Original (red), Lights (blue), and Mint (green). Like all of the company�s super luxury flavored products, New York Cut Mint is flavored by means of crystallized mint in the filter. To support New York Cut, Nat Sherman is launching a national print advertising campaign that will be featured in Esquire, Details, Surface, and Blackbook magazines, as well as several regional, urban titles. �We thought it would be important to have a strong presence in New York, so a lot of the initial publications are smaller New York publications like Time Out New York,� says Larry. Other regional titles include Gotham, Paper, and L.A. Confidential. The campaign has three essential messages. �We wanted to get across that it�s a New York company; that it was an all natural product; and that it was a luxury product,� says Larry. Special efforts were also made to develop interesting point-of-sale materials that would help enhance the retail environment. These include traditional style �tin� signs; shelf talkers; small, full-color counter leaflets; and even a gravity-fed countertop display that resembles a cigarette dispenser. 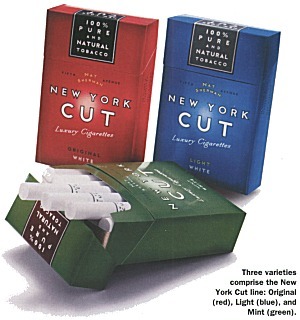 Consumer magazine ads include an offer that directs smokers to a web site created specifically for the brand - www.newyork-cut.com - where, in addition to viewing basic brand information, visitors can register to receive a complimentary three-pack of New York Cut cigarettes by mail if they complete a short survey. Respondents must provide proof of age, and only pay $2.75 for shipping and handling. Even though cigarette smoking is on the decline in the U.S., Nat Sherman Inc. has never sold more sticks than it did in 2001. Even before the launch of New York Cut, the market for the company�s cigarettes has expanded significantly, from two directions, says Joel. Now, with the debut of New York Cut, the company hopes to extend the concept of an �affordable luxury� and the Nat Sherman brand to an even larger audience. For retailers, the past two years have seen numerous refinements at Nat Sherman, including simplified ordering thanks to a streamlined product line, and the adoption of the �cube� carton format across the board. Combined with the operational efficiencies of the new factory - export orders can now be filled in two days, compared to three weeks in the old plant, for example - retailers have more reason than ever to stock Nat Sherman brands. Nat Sherman, Inc., 2200 Fletcher Avenue, Fort Lee, NJ 07024, Tel: (201) 735-9000, Fax: (201) 735-9099, Web: www.natsherman.com.